[SGCA] Full Of Hot Air? First things first, I am not a shooter enthusiast, never have been, and maybe never will. It’s not that I condemn it as stupid or unnecessary; it’s just that it’s never been my preferred gametype, and that my computer has the habit of lagging with every single one I play. JJS seems to have certain talent at the aforementioned creator, but I can only assume that based on the fact of his plethora of featured shooters, and since I'm not a an enthusiast, I can only go on the other editors opinions. The Gas Giant: Moon has an interesting feel to it, much like a meat grinder, they both serve a unique purpose that affects a certain percentage of the population, but I wouldn't want to get stuck in it. The first 10 minutes of playing were bizarre, beings that I was trapped inside of a bounce poly with nothing but my dexterity and an invisible creature, hell-bent on eating me. That being said, I had to die a couple times before I could really comprehend what I was doing. In my adventure of trying to escape Satan’s bounce house (trying to feed my demonic companion a well-balanced breakfast of land-mines and rockets), I found myself teleported just outside the bouncer after going over a patch in the poly. I’m not sure if that should come off as obvious, but that was a rather fascinating endeavor, like disassembling a Rubik’s Cube in order to solve it, sure it was something inventive, but one really needs to ask if it was entirely necessary. After escaping, I found a field of mortars and teleporters, both of which I know enough to avoid in the proper circumstances. After successfully navigating my way to the box that was on the objectives list, I carried on merry my way. 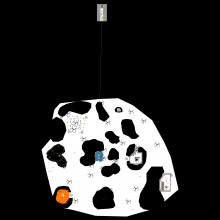 My main issue with Moon was this: THE MAP WAS CONFUSING!!! I found myself lost in the game from time to time, unsure of where I was expected to find the numerous crystals and flags scattered about. I managed to find a crystal in some mud, but that took around ten minutes, so I’m not entirely sure on why I even bothered going on. My journey finally ended when I died in a distant temple, mostly because I ran into some trouble with the underground locals that mistook me for dinner. I would also like to point out that the game felt like it was trying to do too much, although I’m not really sure if it really was... Perhaps I should study up on this? Granted, my opinions are expressed from a standpoint of a platform/physics gamer, so I’m sure I don’t understand the mechanics of a finely developed shooter, although that shouldn’t make a difference. I have had fun with shooters in the past, because they tended to be rather straightforward, not expecting you to find your “adventure” in an unneeded amount of space with a few enemies and puzzles scattered about, seasoned with a tree or two. The latter being the experience I had with Moon. Not that I condemn this experience as evil, I just never cared for it. Fun is a subjective term, and I always want to make it evident that what one finds as fun would sound like a nightmare to another. As an example, I would love to swim in an ocean of whipped cream and chocolate chip cookies, but that would be the absolute definition of Hell to a lactose-intolerant diabetic. In another outlook, should something be fun simply because of the amount of time invested in it? Should The Lord of the Rings be even better because you studied and learned the Elven Language? The point is that we should be expected to have fun in our own way, not requiring a great deal of effort. So did I have fun? Retrospectively, no… I know that shooters have never been my cup of tea, but my lack of a fun experience can be derived from the amount of time invested to get only so far. If you are not the shooter type, I would not recommend this, as it probably won’t influence your opinion on the genre. If you are a devotee to the church of spaceships, go and fly to your heart’s content, lord knows I can't stop you.